Type in catalog.mypclc.org at your browser's address bar. Catalog is available for searching. 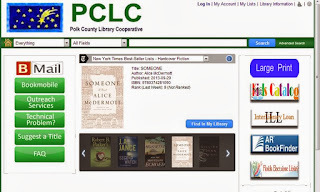 This will be the default library page for most of the Polk County libraries - we're still all city-run - but over the next month or so we'll design and put up individual pages, so the Bartow Public Library page will look a little different. This has been a stressful week for all involved. How's your week been? This will be the fourth time in my career where I will be at a large library system changing over the cataloging/circulation database. When I was at Broward County after 1994 and before 2003, it was when they switched from a Web Cat to a CARL (I think it was Dialog @ CARL, but it's been so long...). It was better networked, more menu-driven, more GUI friendly. When I was at the University of Florida Libraries from 2003 to 2006 it went from WebLUIS to ExLibris / Aleph, which provided more coordination with online databases, a proto version of Integrated Library Systems (ILS). 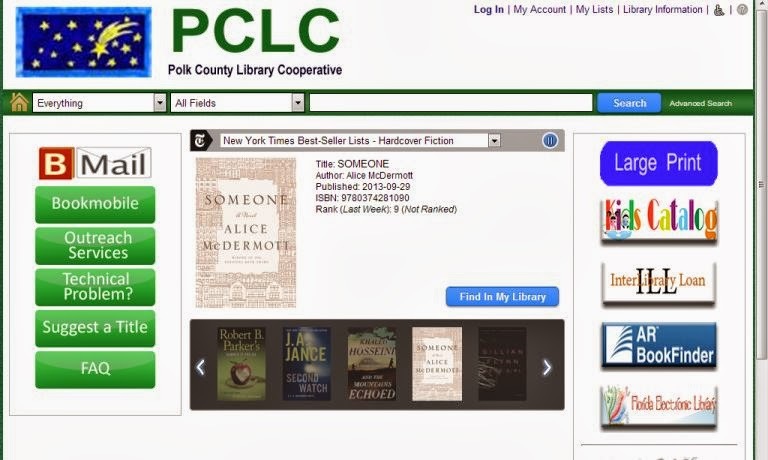 When I was at Pasco County Libraries from 2006 to 2008 it went from CARL (with a DOS-style text-only variant for circ staff, compared to the Internet-friendly OPAC screen) to CARL.X, with a more ILS and keyword-friendly format. Here at Bartow Public Library, as part of the Polk County Library Cooperative we're switching from SirsiDynix Horizon to Symphony, the company's ILS solution. Timing for me is apparently everything. I bet if the Library of Congress hires me they'll decide a few months later to switch over from LC to another cataloging system altogether. Each change in the systems were due to changes in technology. GUI or Graphic User Interfaces weren't really feasible until the mid-90s when the operating systems improved to be more GUI oriented (Win 95, anyone? ), hence a lot of library catalogs were text-based commands rather than selected commands up until 1996 or so. With the spread of the Internet came more online databases and the need to integrate journal and magazine and newspaper articles into search results, needing the ILS formats from 2003 onward. With the advent of e-books and digital printing, the need to integrate e-book collections in OverDrive and NetLibrary alongside the print catalog is a must, which is where Symphony is the choice PCLC is going with. In Other News, IT'S FRIDAY! Relax, it's a homework assignment. Is making sure you're putting the best available links on the main page. And that you're not missing anything. And that you're not being paranoid about missing anything. I thought I'd gotten this "oh no I'm doing something wrong" mentality out of my system ages ago. But I guess being in the first year of a new job is still nerve-wracking about... you know, not screwing up something. Okay, I got a rough draft of the first three chapters of Into The Blue Again done over the Labor Day weekend! Granted it's only about 40+ pages (double-spaced) so far, but it's something, and it's mostly coherent, and I've got a good feeling about how it'll finish up. So I've decided to start shopping for a cover artist to make sure I've got all my ducks in a row before self-publishing it. This snuck up on me as I was getting to bed last night: Gee, ten years ago I was working at the University of Florida Libraries and... OH YEAH that was when my book got published! I had actually finished completing the last story I wanted to add to the Last of the Grapefruit Wars anthology back in May 2003. Submitting the work to the Print-on-Demand service Xlibris went pretty quickly because I had enough of my stuff lined up and because I sped through the editorial process (there are glaring grammar goofs I spotted when the print version got out, my bad). Anyway, on September 2003, boom, actual print copy of the book showed up on my doorstep: two hard-copies and twenty paperbacks. Seeing it available on Amazon.com a few weeks later was part of the thrill. There was a particular thrill to getting something actually in print, in hand, the feel of the book itself. I suppose with the advent of ebook publishing that feeling may fade, although the need for print books may never truly die off... but that's another issue. So... um, for anniversary celebrating... should I offer an autographed copy or something?